TNT Speedway (9/22/01) - Tate wins the TNT Bomber track championship! Marlys filled in for Tate at the TNT Season Championship because Tate's wife Zara was giving birth to twins as the night of racing started. The night was rained out after the A-Mod feature, so no points were awarded. Riverside Raceway (9/15/01) - Fritz won his heat and feature races at Fan Appreciation Night, the last night of racing at Riverside this year. Marlys finished 2nd in her heat race. In the feature Marlys jumped into the lead, but was tapped by another driver, spinning her out. The video tape didn't clearly show the tap, so she was sent to the back. Only 5 laps were run because the time limit was reached due to several cautions, which didn't give Marlys enough time to work her way up through the pack. TNT Speedway (9/9/01) - Rainout. TNT Speedway (9/8/01) - Rainout. TNT Speedway (9/7/01) - Rainout. Riverside Raceway (9/2/01) - Fritz won his Street Stock heat and finished 2nd in the feature at the season championships at Riverside Raceway. Fritz finished the year 2nd in Street Stock points. Marlys had a great night of racing by finishing 2nd in her Pure Stock heat and winning the feature. Marlys placed 2nd in the Pure Stock points this season, her best season yet. Langlade County Speedway (9/1/01) - Fritz finished 3rd in his Street Stock season championship heat and feature races. Fritz finished the season 4th in Street Stock points. Riverside Raceway (8/28/01) - Fritz won his heat race, taking the checkered flag with a broken axle. Fortunately for Fritz all of the other drivers ran into mechanical problems of their own. Fritz was able to work his way up to 3rd in the Street Stock feature. Marlys had another solid night of racing by winning her Pure Stock heat race, and finishing the feature in 2nd place. TNT Speedway (8/25/01) - Fritz wins the TNT Speedway Street Stock championship for the third year in a row! Racing was rained out, and no more Street Stock points races will be run this year at TNT. The Bomber championship will be decided on Sept. 7th. Tate currently leads the Bomber points. Langlade County Speedway (8/24/01) - Fritz returned to Antigo with his original Monte Carlo. In the Street Stock heat Fritz finished 5th. Fritz was fast in the feature and was up to 2nd place before pulling off the track during a yellow. Fritz was back out before the green flag dropped and went on to finish 4th. Riverside Raceway (8/21/01) - Marlys earns another clean sweep in the Pure Stocks by winning her heat and feature! Fritz finished 2nd in both his Street Stock heat and feature races. TNT Speedway (8/18/01) - Fritz gets another clean sweep at TNT in Street Stocks, easily winning his heat and feature races. Tate finished 4th in his heat race after losing his power steering and water pump belts. The motor was very hot after the heat, but was ready by feature time where Tate placed 5th. Langlade County Speedway (8/17/01) - Fritz battled an ill-handling car to finish 3rd in his heat and 7th in the Street Stock feature. Riverside Raceway (8/14/01) - Fritz finished 2nd in his Street Stock heat race and 5th in the feature. Marlys won her Pure Stock heat, but was scored near the back of the feature. TNT Speedway (8/11/01) - Fritz raced on to his second clean sweep this week. Fritz won his Street Stock heat, and was victorious in the feature after starting near the back. Tate finished 2nd in his Bomber heat race. Fortunately he drew the pole position for the accident plagued Bomber feature. Tate won the feature which only ran four green flag laps before the time limit was reached. Langlade County Speedway (8/10/01) - Fritz had one of his better runs at Antigo this year by finishing 3rd in his Street Stock heat and feature races. Riverside Raceway (8/7/01) - Fritz gets a clean sweep in Street Stocks! He also takes over the point lead in the Street Stock division. Marlys finished 2nd in her heat. Unfortuntely her car stalled when she hit the wall in the feature. She was able to refire the car and went on to finish 8th. Marlys still holds second place in points. TNT Speedway (8/4/01) - Fritz collected another win at TNT by winning his Street Stock heat race. In the feature Fritz was running second with two laps to go when he got a flat tire. Fritz went on to finish 3rd. Tate finished 2nd in his Bomber heat race. On lap one of the feature he tagged another driver and was sent to the back. No damage was done to either car. Tate worked his way up to finish 4th in the shortened 10 lap feature. Langlade County Speedway (8/3/01) - Fritz finished 4th in his Street Stock heat. Fritz got spun and hit hard in the feature, but still managed to finish 5th with a severely bent wheel. Riverside Raceway (7/31/01) - Marlys won a clean sweep in the Pure Stocks! She won her heat, and charged up from her 8th place starting spot to win the feature. Fritz finished 2nd in his Street Stock heat, and mananged to work his way up to 4th in the feature after being sent into the wall by another car. TNT Speedway (7/28/01) - The track surface was miserable at TNT due to rain earlier in the day. But the poor track conditions didn't stop Fritz from getting a clean sweep in the Street Stocks. Tate had a very mediocre night, finshing 5th in his Bomber heat and finishing 6th in the feature after working his way from the 13th starting position. Langlade County Speedway (7/27/01) - An extremely dry track made for a challenging night of racing. Fritz finished 4th in his Street Stock heat and feature events. Riverside Raceway (7/24/01) - Fritz repeated last week's performance with a Street Stock heat win and 2nd place feature finish. Marlys had a rough night though, finishing 3rd in her heat and 10th in the feature because of a flat tire. TNT Speedway (7/21/01) - Fritz finished 4th in his heat race after working his way up from the 9th starting position. Fritz then scored another Street Stock feature win at TNT. Tate had his first winless night of the year at TNT, but still managed to finish 2nd in the Bomber heat race and 3rd in the feature. Langlade County Speedway (7/20/01) - Fritz had a better run than last week with the new Monte at Antigo. He finished his Street Stock heat in 2nd, and ended up 4th in the feature. Riverside Raceway (7/17/01) - Fritz scored a Street Stock heat win and went on to finish 2nd in the feature. Marlys continues to inch closer to the points lead. She won her heat race and finished 3rd in the Pure Stock feature. TNT Speedway (7/14/01) - Fritz brought his new Monte Carlo to TNT for the first time, and the handling was much improved over the night before in Antigo. Fritz went on to a clean sweep in the Street Stocks, winning his heat and feature races. Tate won his Bomber heat race. Unfortunately, Tate had his first DNF of the year after other car got into the right rear of the car, breaking the axle in the feature race. Despite the bad luck, Tate continues to lead the points in the Bomber division. Langlade County Speedway (7/13/01) - Fritz completed his new Monte Carlo in time for action at Antigo. The car was not up to speed though. Fritz struggled in both races, finishing 6th in his heat and 8th in the Street Stock feature. Riverside Raceway (7/10/01) - Fritz finished 2nd in his Street Stock heat. Unfortunately the feature was very rough on equipment. As Fritz was passing for the lead on the outside, the driver on the inside took Fritz into the wall. After Fritz jumped the wall and knocked down a fence post, his car was hit hard from behind. Fritz was unable to continue the race. Marlys had a better night though, finishing 2nd in the heat and 3rd in the feature, keeping her in contention for the Pure Stock championship. TNT Speedway (7/7/01) - Fritz makes it two clean sweeps in a row! Fritz went on to victory in the Street Stock heat and feature races. Langlade County Speedway (7/6/01) - Fritz had a superb night in the Street Stocks, earning a clean sweep by winning his heat and feature race. TNT Speedway (7/6/01) - While Fritz was racing at Langlade County, Tate was racing in the Bombers at TNT. Just like Fritz, Tate managed to grab a clean sweep for the night by winning the heat and feature races. Langlade County Speedway (7/4/01) - In place of the usual Street Stock normal races, Antigo ran the special cars vs. trucks events. Fritz did well in both the heat and the feature, finishing 2nd in both races. Riverside Raceway (7/3/01) - Fritz won his Street Stock heat, and worked his way up to 4th in the feature. Marlys ended her Pure Stock heat race in 2nd place. She had a great feature run, working her way up to 2nd place after starting 11th. Tate made his first appearance at Riverside this year. Tate finished 3rd in his Street Stock heat. In the feature Tate worked his way to the lead after starting in 8th, but eventually fell back to 3rd after surviving a near rollover and other hits from various drivers. TNT Speedway (6/30/01) - Fritz won his Street Stock heat race, and went on to finish 3rd in the feature. Tate mirrored Fritz's performance by winning his Bomber heat race, and finishing 3rd in the feature. Langlade County Speedway (6/29/01) - Fritz finished 4th in his Street Stock heat and feature. Riverside Raceway (6/26/01) - Two Scharfs score feature wins for the second night in a row! Fritz and Tate both won their features last Saturday at TNT Speedway. At Riverside Raceway it's Fritz and Marlys winning their features. Fritz won the Street Stock feature, while Marlys won the Pure Stock feature, her first feature win since 1999. Fritz and Marlys both finished 2nd in their heat races. TNT Speedway (6/23/01) - Sunny skies were a welcomed sight for TNT. Fritz had an excellent night of racing, earning his first clean sweep of the year by winning his Street Stock heat and feature races. Tate also had a very good night. Tate finished 2nd in his Bomber heat race from his 7th place starting position. A good draw put him on the pole of the feature, where he went on to victory by leading every lap. Langlade County Speedway (6/22/01) - Fritz finished 2nd in his Street Stock heat race, but struggled a bit in the feature on a rough track finishing 5th. Riverside Raceway (6/19/01) - Fritz collected another win by winning his Street Stock heat race. He went on to finish 2nd in the feature. Marlys had a good night, finishing 3rd in her Pure Stock heat and 2nd in the feature. TNT Speedway (6/16/01) - Rainout. Langlade County Speedway (6/15/01) - Fritz won his Street Stock heat race. Unfortunately a flat tire sent him out of the feature. Riverside Raceway (6/12/01) - Fritz earned his first clean sweep of the year by winning his Street Stock heat and winning the feature. Marlys picked up another victory by winner her Pure Stock heat race. Unfortunately her left front tire went flat in the feature, but she was still was able to charge to a 5th place finish. TNT Speedway (6/9/01) - TNT was finally back in action after two consecutive rainouts. Just like the previous night at TNT, Fritz finished 2nd in his Street Stock heat and 2nd in the feature. Tate won his Bomber heat race. His winning streak was ended, however, with his 2nd place feature finish. Riverside Raceway (6/5/01) - Fritz finished 3rd in the Street Stock heat, and 2nd in the feature. Marlys had a very good night, winning her Pure Stock heat race and finishing 2nd in the feature. TNT Speedway (6/2/01) - Rainout. Langlade County Speedway (6/1/01) - Rainout. Riverside Raceway (5/27/01) - Fortunately the weather cooperated for the Riverside Raceway opener. Fritz won the Street Stock heat race, and finished 2nd in the feature. Marlys finished 6th in the Pure Stock heat race after starting at the back. She won the semi-feature, and worked her way up to 6th in the feature. TNT Speedway (5/26/01) - Rainout. Langlade County Speedway (5/25/01) - Rainout. 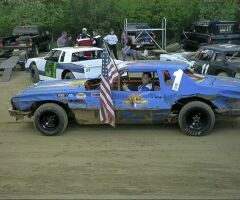 TNT Speedway (5/19/01) - Fritz progressed to 2nd in the Street Stock heat after starting 7th. Fritz repeated his heat race performance by finishing 2nd in the feature. Tate started his first race this year at the TNT Speedway opener. Tate started the night by winning his heat race. Unfortunately the starter died during intermission. After borrowing the starter from the Suburban Tate made a clean sweep in the Bomber division by winning the Bomber feature. Fortunately the feature wasn't any longer because the right tie rod broke, apparently after pulling off the track after the feature. Langlade County Speedway (5/18/01) - Fritz won his first race of the year by winning the Street Stock heat. He went on to finish 4th in the feature. Langlade County Speedway (5/11/01) - Fritz had a rough start to the night when he pulled out of the heat race because of clay packed in the wheel, and was credited with a 6th place finish. Fortunately, the feature went much better. Fritz finished a very close 2nd in the Street Stock feature after starting near the back of the pack, and after leading a good share of the race. Langlade County Speedway (5/4/01) - The racing season has begun! Fritz is back to defend his Street Stock championship at Langlade County Speedway. Fritz finished a distant 5th in his heat due to motor problems. 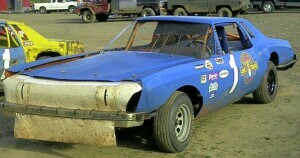 The problem was fixed by the feature, where he managed another 5th place finish. Preseason (2/26/01) - Fritz plans on racing up to three nights a week again this year. With three Street Stock championships to defend, he will have another busy summer. Marlys will be racing at least one night a week, although the tracks and divisions are yet to be determined. Tate's (my) racing schedule is unknown at this time. This website was recently updated for the first time in a few months. The layout is a little more user friendly. Riverside Raceway (Eagle River, WI) rules for each division were added, and last year's racing news was moved into it's own section. Hopefully I'll have time to make more improvements in the near future. Click here for more pictures from the 2001 racing season. Click here for final point standings from the 2001 racing season.